Maluma was nominated for two Latin Video awards at the MTV Video Music Awards (VMAs) on August 20, 2018 in New York City. The last music award show the Colombian native performed was Univision's Premios Juventud in Coral Gables, FL on July 22nd. 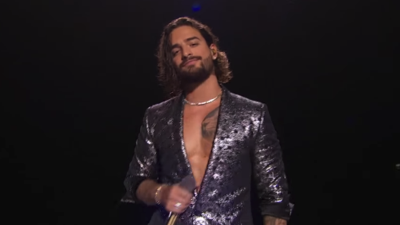 The 24-year old performer and Latin music artist put on quite the show entertaining everyone attending the award show in New York City, as well as the millions watching on TV. Maluma chats with Billboard about "Mala Mia", how he handles negative comments, duo with Shakira and revealing that he would love to collaborate with Shawn Mendes.